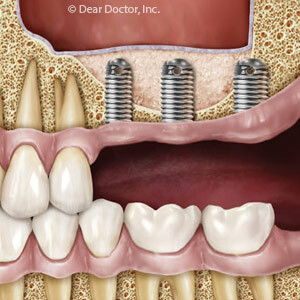 Dental implants are by far the best way to replace missing teeth. But they do more than improve your smile: they can restore your ability to eat, chew and talk properly, especially if the teeth replaced are in the back of your mouth. What’s more, they can improve the entire look of your face by restoring facial height and cheek support lost because of the missing teeth. There is, however, one obstacle to overcome before receiving dental implants — a lack of sufficient bone at the implant site. Bone loss usually occurs when teeth have been missing for some time. This is because when we chew the forces generated by the teeth stimulate continual bone growth to make up for older bone that has dissolved (resorbed). This stimulation doesn’t occur after teeth are lost, which slows the rate of bone growth. Over time the amount of healthy bone diminishes. Without enough bone for support, implants can’t be placed properly. Fortunately, some of the bone can be regenerated through techniques that place bone grafting material at the site to stimulate and serve as a scaffold for new bone.Â The new bone will eventually replace the graft. For missing upper back teeth with bone loss, we can take advantage of facial anatomy to grow the bone needed for implants. This area of the face is where the maxillary sinuses, air spaces lined with a tissue membrane, are located on either side just above the upper jaw. After determining their exact size and location through detailed x-ray imaging, we can surgically access the area inside the mouth just above the missing teeth. The sinus cavity is an area where bone growth can occur by placing a bone graft between the floor of the sinus and the sinus membrane. Sometimes bone growth enhancers are used to stimulate and speed up regeneration. The procedure can usually be performed with local anesthesia (much like a routine tooth filling), with only mild discomfort afterward for a few days managed by an anti-inflammatory drug like ibuprofen and a decongestant for sinus swelling. After six to seven months, we re-evaluate the area to see if sufficient bone has returned for implant surgery. If so, you will be well on your way to achieving a new look and better function through dental implants.